This lovely vegetarian dish looks so auspicious! I liken the lovely pieces of mushrooms to ancient coins sitting on pieces of jade and taels of gold! Ah, I got carried away again when talking about symbolism and auspicious food for Chinese New Year ! 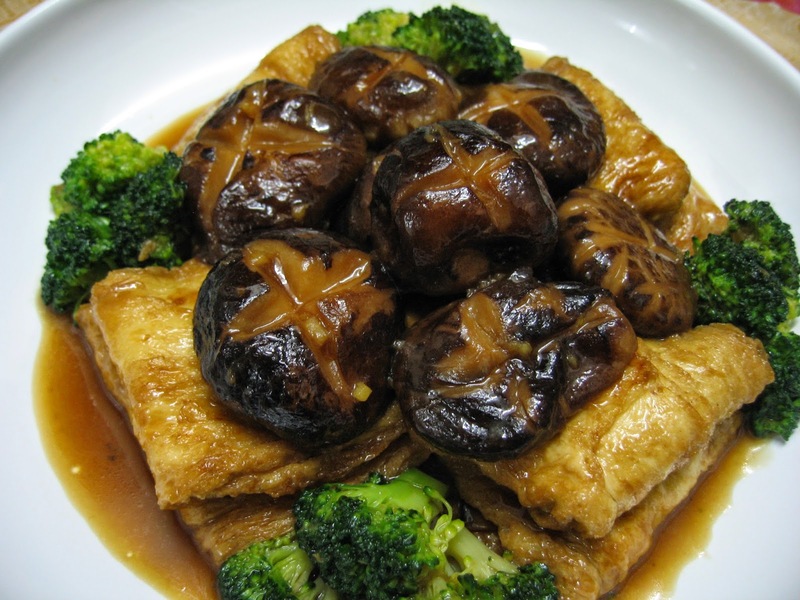 The "taels of gold" are vegetarian bean curd wraps. The Cantonese called them tau pau. 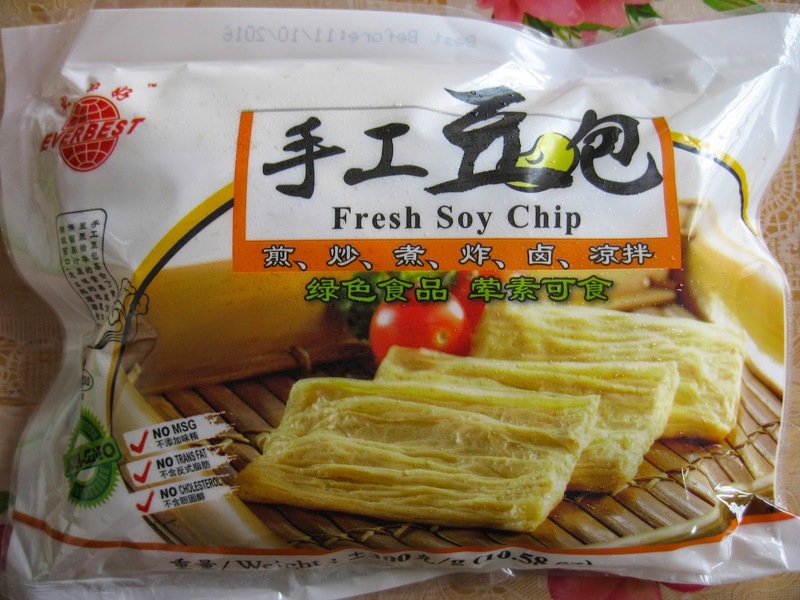 They are soy products and rich in protein. This dish is popularly served at eight-course dinners during Chinese wedding banquets. I always look forward to this vegetarian dish because I love eating the bean curd wraps. I am cooking this for Chinese New Year. The taste is absolutely awesome! Mix together to form a solution. Let it thaw. The pieces will be easier to separate after thawing. Use kitchen towels to absorb the moisture before deep-frying. 1. Heat oil to deep-fry tau pau. Remove,drain and set aside. 2. Heat 1000ml water in a small pot and bring to a boil. Add 1 tsp salt, 1 tsp sugar and 1 tsp oil. Blanch the broccoli florets for 1 minute. Remove and drain well. 3. Heat 1 tbsp oil. Saute minced ginger and mushrooms. Fry well. 4. Add seasonings, water, deep-fried tau pau. 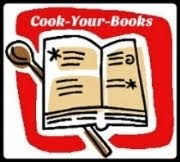 Cover and cook for 5 minutes. 5. Add thickening solution and mix well. 6. Toss in the broccoli and stir to mix well. I also like this auspicious dish,especially the yummy "taels of gold" . May you come into real taels of gold this coming CNY. Wishing you a happy and prosperous Chinese New Year. Hi, this one looks super delicious and healthy too. It sure is and thanks for visiting. I love tau pau. 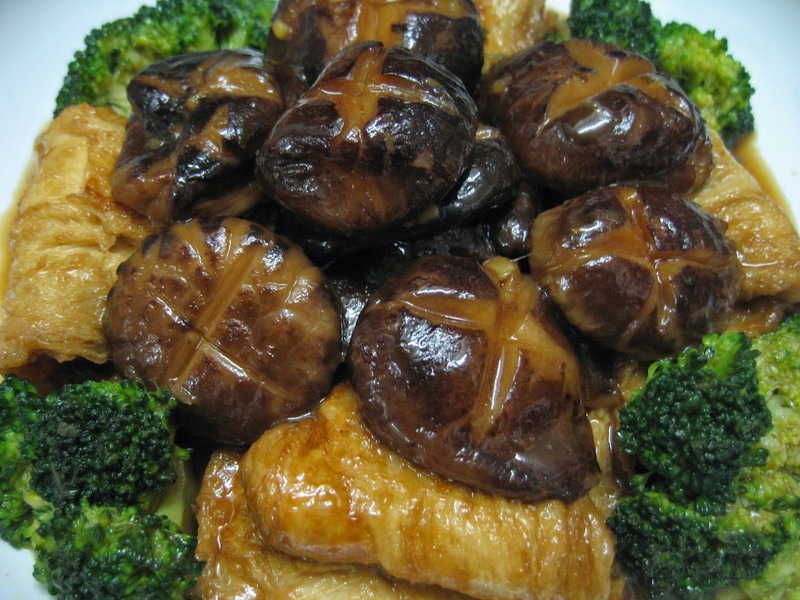 The combination of tau pau and shiitake mushroom is just fantastic. A perfect dish to serve during CNY ! It sure is and wishing you a happy and prosperous CNY. Thanks for visiting and wishing you a happy and prosperous Chinese New Year. Hi Doris, I just bought a packet of round shape Tau Pau. Will cook it this way. Looks like restaurant style dish. Nice. Thanks for showing the packaging of Tau Pau, I have no idea how it looks like, but now I know! This is a great dish for CNY, your presentation looks like it is served at chinese wedding banquets! Nice to know that I am of help. Wishing you a happy and prosperous Chinese New Year. Wow, your dish looks so delicious! And it looks really festive! Your family is going to have feast with all the delicious CNY dishes you are cooking! Thank you for sharing. 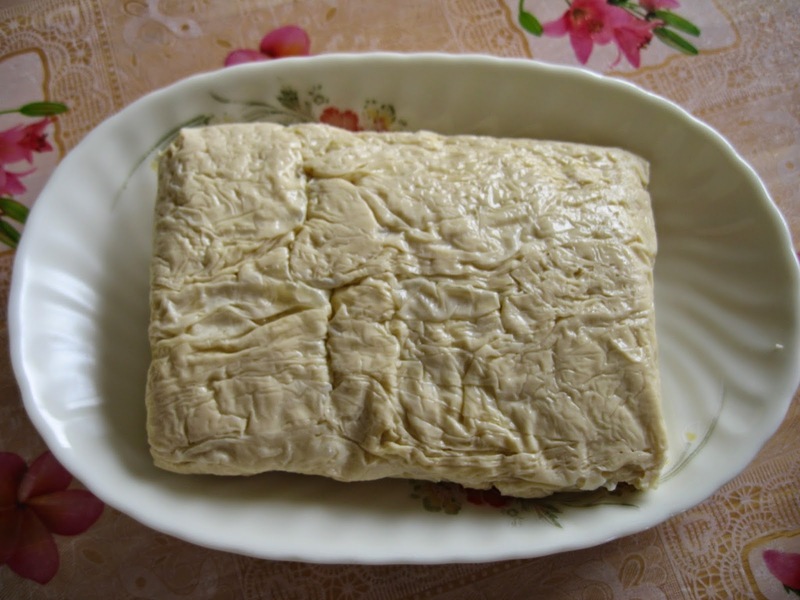 Since I have some tao pao in my freezer, gonna make this for reunion dinner. Wishing you a happy and prosperous Chinese New Year!